AutoCAD will return to the Mac platform this fall. AutoCAD is coming back to the Mac, and this time it will be free. The archetypal computer aided drafting program from Autodesk, which for more than a decade has been available only on Windows operating systems, will ship this fall for Mac OS X, along with mobile editions for Apple's iOS devices--iPad, iPhone, and iPod touch. The new Mac edition will be free for students and teachers through Autodesk's Education Community. 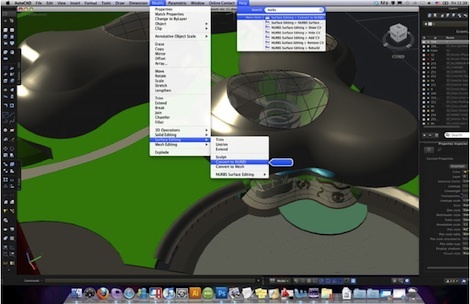 Running natively on Mac OS X, AutoCAD 2011 for Mac will include "many" of the features available in the Windows edition (which, incidentally, can run natively in WIndows on all Intel-based Apple hardware using Boot Camp or through desktop virtualization using products like the open source VirtualBox or Parallels Desktop). It will support Mac-specific interface features, including multi-touch gestures, and will include full native DWG file support (and compatibility with files created in other editions of AutoCAD), according to Autodesk. It will also offer an API, allowing users to generate custom applications, workflows, and interface configurations. Integrated rendering, including photometric lighting. AutoCAD WS, the mobile edition for Apple iOS devices, will allow users to share and edit AutoCAD files on their iPads, iPods, and iPhones. It will be free for all users. 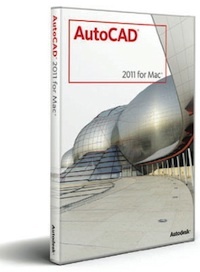 AutoCAD 2011 for Mac is expected to ship in October. The Mac edition will require recent Intel-based Apple hardware, including Mac Pro, iMac, MacBook Pro, and MacBook systems. The full version, currently available for preorder, runs about $4,000, but students and educators will be able to download the software for free. Further information about the education offer can be found here. AutoCAD WS is expected to be available this fall ("soon") for iOS devices via the App Store.